I was pretty hungry about 4 pm, but we weren’t ready for dinner. I had some work to do for our web design company, and I wanted to finish it up before I started cooking. 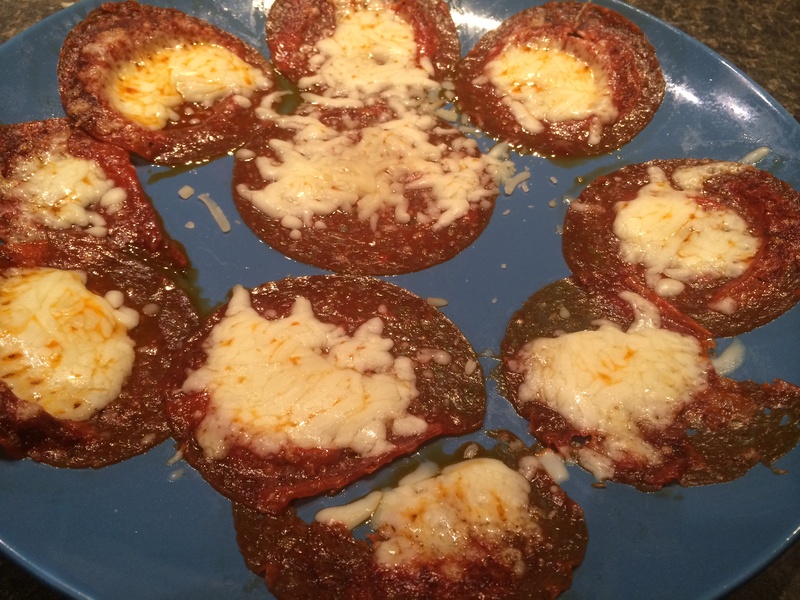 Take some pieces of pepperoni, mound about a tbsp of mozarella in the center of each, put the plate in the microwave for about 30 seconds – and VOILA! 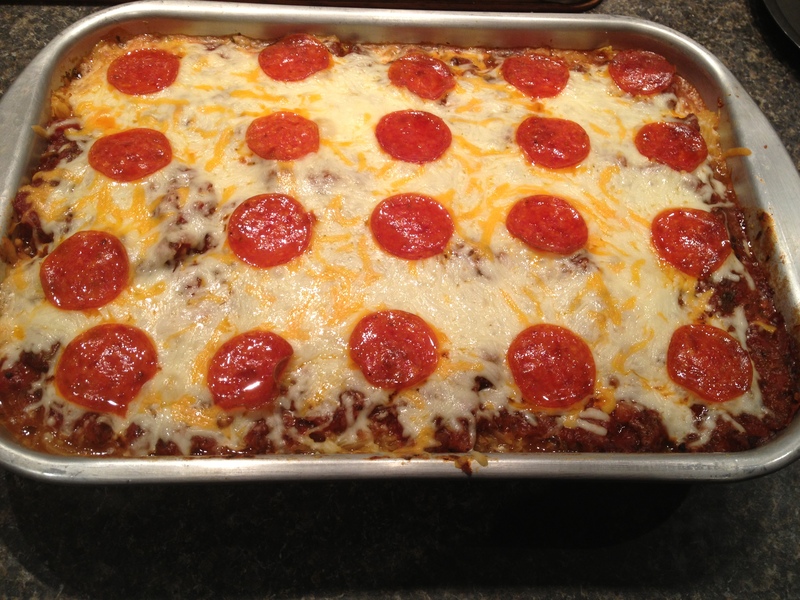 tasty hot pepperoni pizza treats. They were quick and delicious and assuaged my hunger until dinner could be prepared. For dinner, I cooked a pound of ground beef, added taco seasoning and put the mixture on a plate. 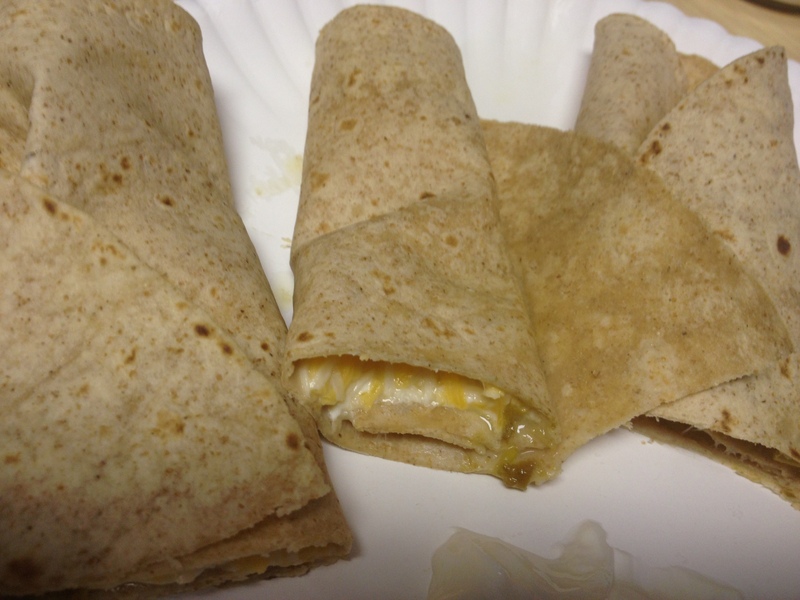 I topped it with grated cheddar cheese, chopped onions, one half an avocado, and a tablespoon of sour cream. I’ll admit, I do love a taco shell, deep fried flour tortillas and all those other crunchy Mexican carbs, but this meal still tastes good and is a great substitute for carby Mexican meals. One of the most effective tricks during a diet is routine. Eat the same meals over and over or plan your meals ahead for the whole week. I’ve found it effective to pre-make dishes on Sunday and have them ready for the week. That makes it incredibly easy to stick to the diet because I avoid thinking which means I avoid creativity and creativity requires decision making which leads to hard choices. Just avoid the hard choices and have it all planned and some of it ready to grab and go. The Basic Keto Diet, a page on Mike Maunder’s blog, has about everything you need to understand the ketogenic diet principle, plus a list of foods and menu plans. It’s thorough and inspiring. I was running late yesterday morning. I would have gotten to work about 1/2 hour early if I skipped breakfast or stopped for a drive thru McDonald’s breakfast. Hmm. Hardly the way to get back on track. I had really been looking forward to hitting the diner with Rick, but we both hate rushing through breakfast in fewer than 25 minutes. I hit on the remedy – carryout breakfast from the diner. It’s just a little out of the way from work, so I called ahead and ordered an omelet and bacon. We swooped by to pick it up, and I arrived at work 1/2 hour early, where I relaxed, did a crossword and ate breakfast at my desk. It was more expensive than a breakfast at home, and a couple of dollars more than a Micky D’s breakfast, but I’ve spent money on worse things. It was a good start to a fresh keto diet day, and I’m glad I thought of it. Lunch was late – around 2 pm, after an afternoon meeting. I ate 2 Beddar Cheddars and some almonds. Dinner was a recipe I haven’t posted before: Rick’s chicken Marsala. 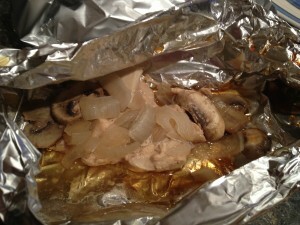 He makes a quick and convenient dinner in individual foil packets that we can both easily eat as leftovers the next day – or for lunch. He usually sacrifices and leaves the leftovers for my eating pleasure, because he can eat anything, after all. Dessert was an Adkins coconut bar. I know I need to plan ahead to be successful on the keto plan, and to avoid all those carb-laden “easy” foods. Sunday morning, I decided to make a quiche that would last me the week. I used this crustless quiche recipe, from the Budgetbytes blog, and adapted it a bit. I made a spinach, feta cheese and onion quiche, and it turned out a little too “green” for me. Next time, I’ll try adding more eggs and cream. I like my quiche to be eggier. Rick liked it alot. I like having an “instant breakfast” to take to work during the week ahead. That’s all I really have to report for Sunday. I didn’t get time to blog all week, and I can’t remember what I had for dinner, but I was pretty strictly on keto since I know I’ll be having a few cheat days at the end of the week. My birthday is on Thanksgiving, so I’ll be having cake that day (plus whatever other carbs at dinner) and the evening before, my neice is taking me to dinner and a movie. I will have about 4 cheat meals in a row, so I’m eating as well as I can in anticipation. Rick went shopping to get a variety of ingredients I need to create some keto-friendly Thanksgiving desserts. I’d like to try something with pumpkin and cream cheese. YUM. Yesterday was Friday and the last day of diner eating. Rick and I decided it’s a bit much to go to breakfast every day – it’s a bit too much on his waistline and our pocketbook. I plan to make a quiche Sunday. I’m hoping that will motivate me to eat at home before work next M-W (Thursday is Thanksgiving, so no work). After work, of course I did not feel like cooking, because I NEVER do. However, I’ve been wanting to try a taco soup recipe my son Brandon has been making. He let me taste it at work this week, and it was really yummy. Rick did the shopping while I was at work, of course. He makes keto easy! 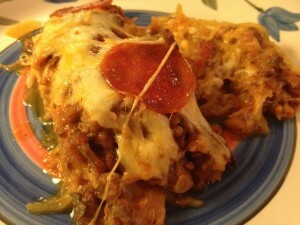 I must give credit where credit is due, the recipe is from LINDA’S LOW CARB MENUS & RECIPES. She has a lot of really good keto-friendly recipes on her site. I had forgotten about this site, and I’ll have to reinvestigate it soon. I adapted the recipe a bit. I only used one can of rotel tomatoes. I assumed correctly that these made up the bulk of the admittedly small amount of carbs in the recipe, but I’m not that fond of tomatoes and I thought I’d save carbs where I can. One can equals 10 grams of carbs, so that’s a significant savings. As I started laying out the ingredients, I sadly discovered that the cumin bottle was nearly empty. Sigh. Rick and I searched the cupboards for another jar, but there was none to be found. I did have a jar of taco seasoning mix, so I subbed that for the cumin and chili powder. It was still tasty, but not as good as the spoonful I tried of Brandon’s “original” recipe. I think mine ended up about 2 3/4 grams of carbs per servings, which is very very good. Unfortunately, I forgot to take a picture of the soup, but it looked just like the one on Linda’s page. It only took about 15 minutes, so I’m sure I’ll be making this again. We finally decided not to go out to breakfast. Just too costly. 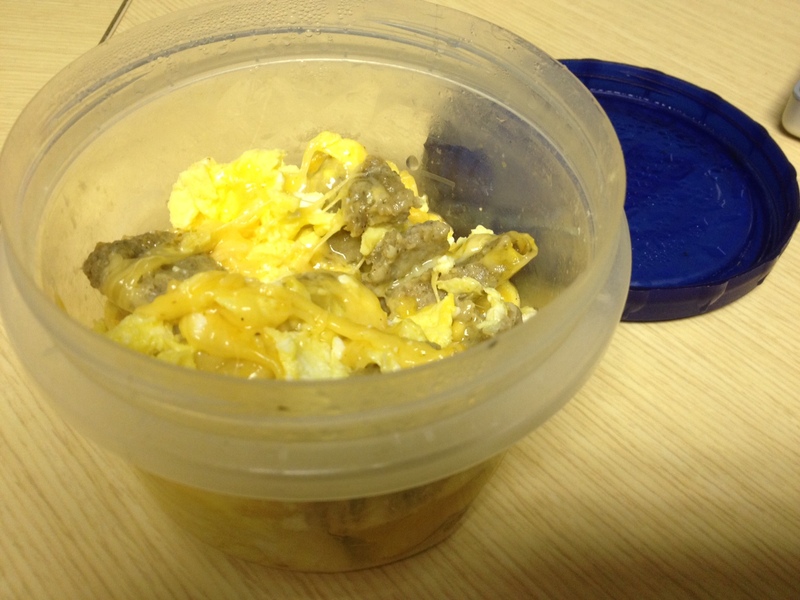 Rick made my “breakfast bowl”: 2 eggs, 2 sausage patties, cheese, and Taco Bell hot sauce. He puts it in a bowl, and I reheat, chop up, and eat at my desk. MMMMMMMM. Thanks, honey. I was going to eat 2 Beddar Cheddars for lunch, but I got a surprise lunch invite from my niece, Marsha. The AUCE Chinese restaurant that we both love is very near my workplace, so I agreed to lunch with her. I debated if I could do a low carb lunch, or if it was too difficult with the few options that I should just do a cheat meal. I sort of did a blend of both options. I went to the Mongolian section and made a bowl with chicken, onion, garlic, and a little crab. I asked the cook to use garlic oil – he offered spicy; I said sure. It turned out to be delicious. Unfortunately, the Mongolian counter was at the back of the store, past the crab rangoons and the tempura sushi. Sigh. So, I sort of did a half and half cheat meal. I had a main course that was low carb, and side dishes that were coated with breading. I do think I’ll get some garlic oil and try to make my own “Mongolian” stir fry at home. It’d be pretty easy, and keto-friendly. Always looking for some fresh ideas for keto recipes. 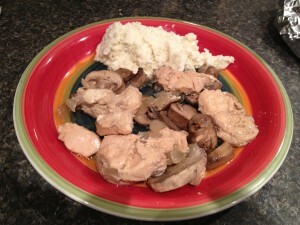 I saw this idea on several low carb sites, but most of the recipes, although low carb, were too high in carbs for keto. Rick did some investigating while shopping and found that a 14 oz can of Del Monte diced tomatoes with zesty mild green chilis was 7g per can, and Kroger tomato sauce was ZERO net carbs per can. He used 2 cans of each in his recipe, with 2 tbsp of olive oil (og), and various ingredients like garlic, 1/2 cup onion (10g), and 1/2 cup of red wine (4g). The whole recipe is posted here. After work, I cook a whole large spaghetti squash, gathered the rest of the cheeses and ingredients and assembled a lasagna. Approximately one hour later, we sat down to a delicious bubbly authentic-tasting lasagna meal. At approximately 7.4 grams of carbs per serving, it surpassed my wildest dreams. I am no cook, but Rick’s marinara sauce is really flavorful and added to cheese and pepperoni, this tasted almost like my dad’s traditional recipe! 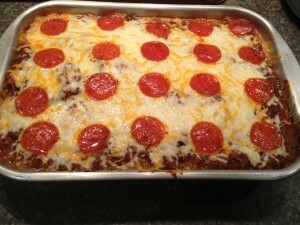 So, dinner was a hit, and I have lots of servings to warm up during the week. This will definitely be a staple of my keto diet, and I’ll be making it a couple of times a month. I have to recalculate and be sure I didn’t mistake any of the carb counts. For instance, the mozzarella cheese said less than one gram of carbs per serving. Well, if you have many servings, when does that become 1 or even 2? We each had an Adkins coconut bar for dessert. It was kind of an up and down day in terms of the keto plan, but creating such a keto-friendly pan of lasagna was a real high point of the day. Well, I really enjoyed that early morning breakfast Wednesday, so I made the effort to rise early and try it again. This time, we went to the Senate Coney Island, which is a bustling diner even at 7:30 am. I ordered a cheese omelet, asked them to add grilled onions, and skipped the toast. The side of bacon was enough for me to share with Rick. I topped the egg with sour cream (of course) and called it a meal. The service was fast, the omelet was delish, and the bacon was perfect. No extra hash browns to deal with and I just skipped the toast. We’ll be back. Lunch was on the run, again. More paperwork and banking to do. This house closing is dragging on, and there are still details to cover and items to move from the house. We went to Big Boy. Since this blog is all about honesty, I had a really difficult time deciding NOT to eat carbs. I love BB fish and chips, so that was hurdle one. I was tired, stressed and hungry (too hungry), so my decision making processes were hampered by the need for some comfort food. 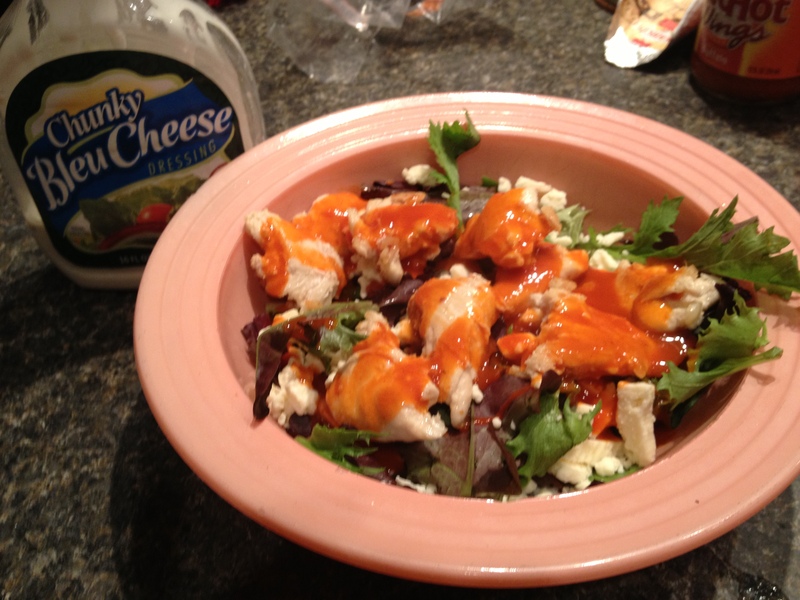 I had tried the buffalo chicken salad a while back and decided to try that. The spiciness might make me feel like I was having some tasty treat, and the blue cheese dressing that comes with would be creamy and fill that need for comfort. It was a hit! I was a little worried that I made a wrong choice when I saw that the chicken had some kind of coating on it, but at that point, I was eating it no matter what. The tangy buffalo sauce was subtle on the small slices of chicken and blended well with the blue cheese. It was filling and delicious. Again, I forgot to take a picture, so here’s one that looks similar. I will definitely be ordering this again soon, so I’ll get an authentic one on my next visit. I looked up the nutrition information when I got home and it passed muster. Without croutons (which I removed), it’s 10.2 grams of carbs minus 2.3 grams of fiber, for a net of 7.9. That’s not counting the blue cheese dressing, but after a really low carb breakfast, I knew I’d be able to stay under 19 for the day. It also looks like they have similar salads at Chili’s and other restaurants. Bad afternoon – I worked until 6:30. At 5:30, that damned Halloween candy bowl at work called my name. I ate a peanut butter cup and 9 whoppers (actual circles of candy, not packages). I have no defense. 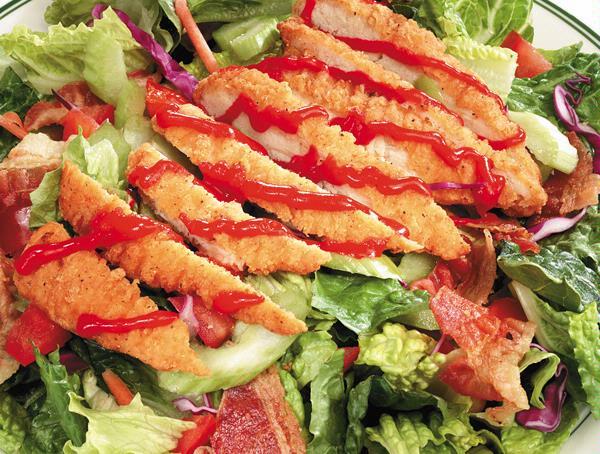 I do think a salad doesn’t stick with me long enough to ward off the temptations. Whatever. I guess I’ll just have to plan ahead in case I’m tempted again tomorrow – drink a lot of water and eat almonds in the late afternoon? Dinner – home late again. Rick didn’t feel like cooking, so we stopped to pick up a rotisserie chicken. Again, I was tempted. I had already eaten candy, so how about some macaroni salad on the side? NO NO NO. Rick didn’t buy it, and I made cauliflower mashed potatoes instead. Wonder why this is so difficult lately. Oh, here’s a tip I figured out in the past few months. I really like the cauliflower mashed potatoes, and I really don’t like cooking very much (in case you didn’t figure that out). I now buy small frozen packages of cauliflower and have about 4 on hand. 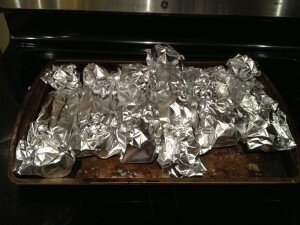 I use the same recipe as I have posted here, but here are the amounts of the ingredients I use with this size package…. Easy peasy cauliflower mashed potatoes – open one bag of cauliflower, pour in bowl, microwave 5 minutes. Put the cauliflower, 3-4 tbsp of cream cheese (definitely less than half a package), and one tbsp of butter into a food processor. The cauliflower should be steaming hot to melt the cheese easily. Process and eat. One package makes a little more than 2 servings. If Rick doesn’t eat his, it warms up well the next day. Well, that quick recipe was a life savor, and I avoided the carby macaroni salad. I ate about 6 ounces of chicken with the “caulitatoes.” Dessert was 2 squares of chocolate with natural peanut butter. Breakfast was yogurt, as usual. I do think I’m going to start eating a bigger breakfast next week, since I’ve been ready about the issue of slow metabolism and eating a good breakfast is a key to improving it. Lunch was 2 delicious slices of leftover shawarma pizza. If you recall, I accidentally took crusts only for lunch yesterday. I really like this pizza, even without the crust. I had about 3 hours after work before I had to be at the Thursday family trivia night at Marvaso’s. We’ve been winning steadily and had $40 more gift certificate dollars to spend, but they don’t have a lot of low carb choices. Rick offered to grill up some steaks, so I made the onion, blue cheese sauce, plus sauteed some mushrooms as a side dish. The combination was delicious. I posted the recipe on my site, but if you’d like to see the original, it’s here: The Pioneer Woman website. I ordered a Caesar salad and water at trivia and took half the salad home for tomorrow’s lunch. I’m back in the swing of things. We’ll see how the weigh-in goes. After bills, budgets, design jobs, and other fun paperwork, it was time to go work on the rental house. For brunch on the way, we went to Papa Elias’s Pizza Buffet. We worked on installing doors again. What a pain. Afterwards, we headed home. I wasn’t hungry because of the huge brunch, so I headed back to my office to list ebay items and work on catching up on this blog. In the evening, I decided to try the hamburger/broccoli alfredo casserole recipe Brandon tried last week from Linda’s low carb recipe site. It wasn’t too complicated, although Brandon recommended using more heavy cream and 1 1/2 times the cream cheese. I did, and it was very tasty and I ate 2 servings. I’ll take a picture of it when I heat it up for dinner. For dessert, I made some chocolate mousse.